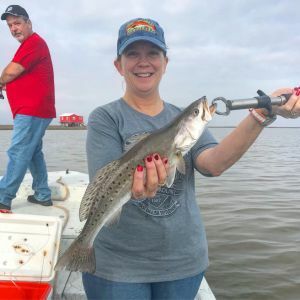 The Upper Texas Gulf Coast historically has been the gem fishery of the Lone Star State for decades. 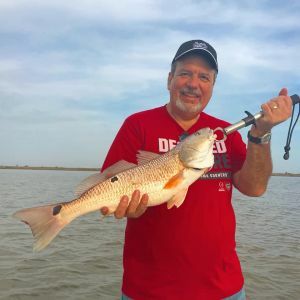 Deep water channels, shallow sand flats, oyster beds, grass beds, and miles of jetties that connect Galveston Bay to the Gulf of Mexico. Deep water holes, channels and canals give refuge when water temperatures drop in the dead of the winter which allow these cold-blooded creatures to survive the harsh elements that other bay systems may not have. 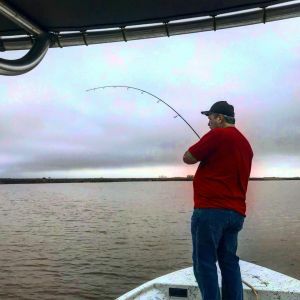 Yes, it may be true that temperatures do not drop very often that would create a major kill… but the few times that it has happened in my lifetime – The Galveston Bay System survives. May take a punch or two… but is still in the ring fighting another round. Yesterday was far from one of the cold days of February. It was the opposite. Some of my best winter fishing trips have been in February when the air temperature rises, water temperatures get into the 60’s – and the fish come alive. I had long time customers Michael and his wife Kristy on the boat yesterday. We had to wait for the fog to burn off, so the start of the trip was noon. As I was launching the boat, I had a sweatshirt on and a jacket. Soon I realized… I overdressed. Temps were on the rise, and before I tied the boat off to the dock… I had already stripped the jacket and sweatshirt off and was t-shirt ready. I pulled the truck and trailer out of the ramp, and as I was walking to the boat, I quickly realized the water surface was alive with shad and mullet. This is going to be a good February trip… I am sure of it. Michael and Kristy arrived, we loaded up and took off. As I was driving down the back bayou heading to the bay – I quickly realized the temperature reading on my GPS/Depthfinder reading 62.1 degrees. I hadn’t seen that surface temp for a while. The very first stop I made was on a 2ft deep mudflat with a drain and an adjacent drop off into 8ft of water. On the very first cast with a live shrimp under a popping cork – Kristy hooks up with a beautiful 25.5” redfish. This kind of action did not stop the entire trip. We moved around and hit half a dozen of my go to spots, and every single one had active bait fish and feeding fish. We caught redfish, speckled trout, flounder, sheepshead and black drum. The scenario that happened yesterday is almost text book Galveston Bay Winter Time Fishing. Fish are cold blooded creatures. Water temperatures get into the low 50’s and 40’s – fish can be tough to catch. They are waiting on the temperature to rise, and when it does – they eat. They eat. They eat allot. The fish know that they must eat up because more than likely the warm window wont last long, and it will get cooler again. Shallow water flats that are close to deep water are key during the winter months. Quick access to the shallow flats from the protected deeper waters is key. 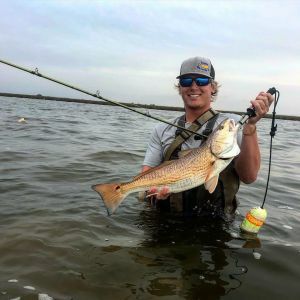 Bait fish will get up on the flats when the sun beats down on the mud making the temperature rise, and the redfish and speckled trout will not be far behind. This is a weather window of opportunity. We can not always plan our trips for the windows, but when they present themselves – get out there and get hooked up. 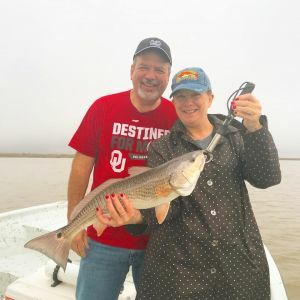 Galveston Bay Winter Fishing can be some of the most fun had.